Golden brown colored body with a white belly. Large, glassy marble-like eyes and long, sharp teeth. Spiny dorsal fin. Up to 18 lbs., 1 to 3 lbs typical. 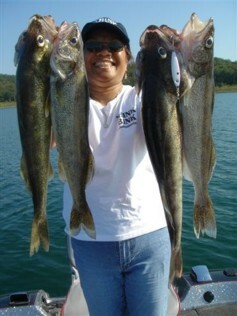 Walleye are numerous and one of the most popular fish in Norfork Lake. They can be found throughout the lake depending on water temperature and dissolved oxygen concentration. 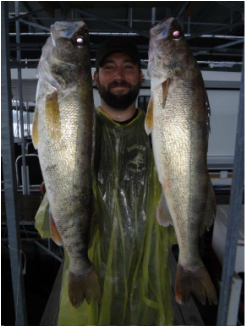 Walleye are found near or at the bottom most of the time where they feed on shad and small bait fish throughout the year. Late winter and early spring find walleye on the move in the creek arms to spawn. 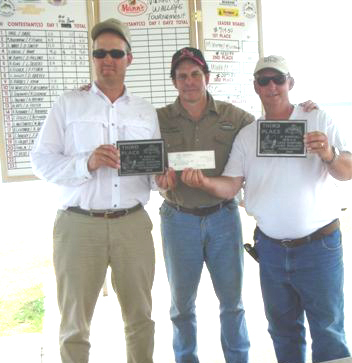 These fish can be caught with a wide variety of baits depending on the time of day. During spring and early summer walleye move out of the creeks onto the main lake brush and chunk rock where they can be caught with deep diving crank baits and spoons. Summer and early fall find the walleye schooled much deeper, due to changes in water temperature and oxygen levels, where they can be caught effectively by jigging a Bink's Spoon. The fish will stay in this pattern until early November. Late fall and winter is the time when Bink looks for walleye on steep, rocky drop offs near high bluff banks. At this time of year fishing techniques change dramatically. The depth can vary from 5 to 60 feet. 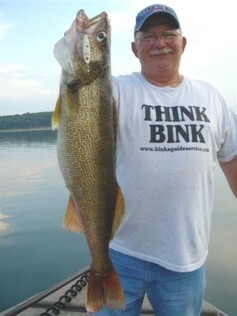 One of Bink's unique patterns is horizontal spooning for suspended walleye and another pattern targets fish that are deeper than any other time of the year. Spooning for walleye is one of the deadliest methods an angler can use and will catch fish throughout the year.